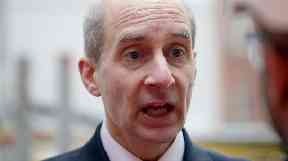 James Mertins' e-mail said the Labour peer should be 'put up against a wall and shot'. A pro-Brexit pensioner has been fined £260 for sending a threatening e-mail to Labour peer Lord Adonis. James Mertins, 67, from Edinburgh, sent the e-mail which called Lord Adonis a "traitor" and said that he should be "put up against a wall and shot". Mertins also included in his email: "It is time to get rid of the House of Lords one way or another" and "Democracy is dead in Britain and that he (Lord Adonis) should watch his back". At the Sheriff Court in Edinburgh on Wednesday, Mertins admitted to sending a message of a menacing character, which contained threats of violence, to the 55-year old peer on January 5 this year. Fiscal Depute, Anna Robertson said the e-mail added that the British people had voted to leave the "corrupt EU" and "that it was time for us to stand up and get rid of the likes of you". The message was signed "Disgusted". The Fiscal said the e-mail was traced to Mertin's home. Ms Robertson said he co-operated fully with the police and told them he was unhappy with the way the democratic vote for Brexit was being challenged. Defence lawyer, Katie Malcolm, said her client had made the comments in "in the heat of the moment" in relation to the "Leave Voters". "He very quickly was ashamed and mortified and wrote to Lord Adonis to apologise" she said and added "there was no serious intent behind it". Sheriff Noble said he accepted that Mertins had been expressing his views, but it had a menacing character with reference to Lord Adonis being put up against a wall and shot and that he should watch his back. Sheriff Noble said he would have fined Mertins £400, but he would reduce that to £260 because of the early plea of guilty and that could be paid at £40 a month.